These are old fruits, thought to have originated almost 5,000 years ago in the Kalahari Desert of Africa. Seeds were brought to the U.S. by African slaves. Thanks to hybridizing, there are over 100 varieties of watermelons, in assorted sizes, shapes, and colors. Exposure Full Sun. The plants can tolerate some partial shade, particularly in hotter climates, but you want plenty of sun to develop the sugars. Hardiness Watermelons are annuals. They are very susceptible to cold weather and frost. Days to Maturity This varies greatly. Long season watermelons mature in 80 to 90 days. Those bred for a shorter season can mature in as little as 70 days. These are self-sterile hybrids. They can be grown by seed, but they will not produce any viable seeds to save. They are not truly seedless, but the seeds do not mature and remain, small, white and edible. Seedless watermelon seeds have a lower germination rate and they are more expensive than seeded watermelons, so starting them in peat or paper pots will give you a slight edge over risking starting them in the ground. Judging the ripeness of a watermelon requires some experience, but there are a few signs that can help you learn how to determine when they are ready. The watermelon rind will start to become dull. The curly tendrils on the vine, near where the melon attaches, will turn brown. You should not be able to piece the rind with your thumbnail. The part that rests on the ground will change from pale light green to a pale yellow. Don't store uncut melons in the refrigerator. Opt for a cool room (45 to 50 F.), if you can find one and they will keep for up to 2 weeks. Better yet, eat them right away. Cut watermelon should be refrigerated and only keeps for a few days. Gardeners with short seasons can get a head start by warming the soil with black plastic, a couple of weeks before seeding. Row covers over the young plants will also help to keep them warm, but remove once the flowers begin blooming. You can reapply them at the end of the season, for a little extra frost protection. Soil: A neutral soil pH of 6.0 to 6.8. is best. Watermelon plants are heavy feeders. Make sure your soil is well amended with organic matter, before planting. Sowing: Watermelons can either be direct sown in the garden; danger of frost or started indoors in paper or peat pots, about 3 weeks before your last frost date. Plant seed 1 in. deep. Direct sow 4 to 5 seeds per hill or pot. When seedlings develop true leaves, thin to the strongest 2 to 3 plants per hill or 1 to 2 plants per pot. Don't leave them in the pots too long or they will suffer transplant shock. Seeds need warm soil to germinate. Indoors, aim for 80 to 85 F. You can warm the soil outdoors by covering it with black plastic. 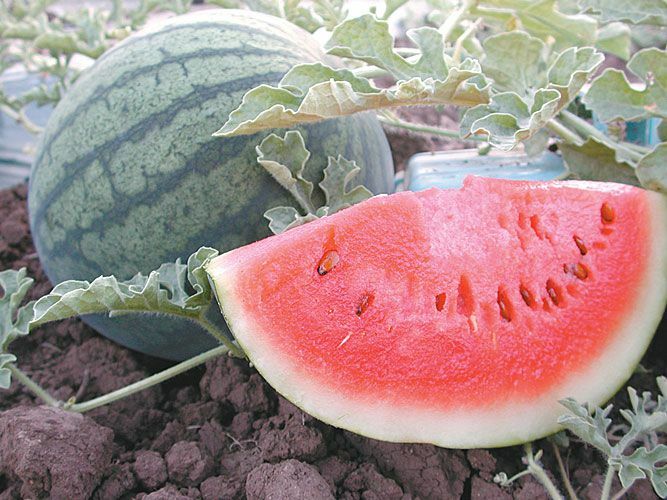 Note: Seedless watermelon plants will need to be interplanted with regular seeded watermelon plants, for pollination. If you want to be certain which harvested fruits are seedless, choose a pollinator that does not closely resemble the type or color of your seedless variety. All watermelons produce large vines and they will need a lot of space to sprawl out. Space hills at least 4 to 6 ft. apart, depending on the variety. As with other melons and squash plants, watermelons set both male and female flowers. The male flowers start blooming first, so don't be surprised if you see flowers bloom, fall off and no fruits develop. Only the female flowers produce fruits, which you will see forming right behind the flower. Watermelons need regular watering when first transplanted. Once they begin setting fruits, you can ease up on the water, unless it is an especially dry season. Their roots are relatively deep and they can withstand short dry periods. In fact, they will lose sweetness if given too much water. Keep the area weed free. If your soil is lacking in organic matter, add a slow release organic fertilizer at the start of the season. To keep them growing steadily, side dress mid-season with a layer of compost. You will generally get only 2 to 3 watermelons per vine. Gardeners with short seasons should prune off any flowers that form during the last 6 to 7 weeks before your first frost date, to encourage existing fruits to ripen in time. The biggest watermelon pest is the cucumber beetle. Monitor for the eggs early. If you are using a row cover, you will exclude many of them from the vines. They are also prone to vine borers, aphids and mites. Several diseases can be a problem, including Fusarium wilt, anthracnose, alternaria leaf spot, and gummy stem blight. Choose resistant varieties.